The border between visionary creation and madness is sometimes tenuous, and many artists experienced bouts of madness. Van Gogh cut his own ear while confined in a psychiatric hospital, William Blake had conversations with dead poets, Goya was hearing voices and Munch was convinced of being condemned into madness since birth. The Surrealists Leonora Carrington, Unica Zürn and Antonin Artaud also spent time confined in asylums and captured their experiences of madness in their art. The lives of outsider artists are just as inspiring, ranging from the 45-volumes magnum opus of Adolf Wölfli to the compelling portraits of schizophrenia by Bryan Charnley. 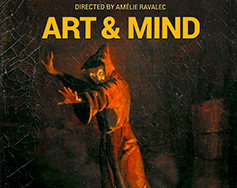 Art & Mind unveils the history of Art Brut, from its foundations in the dark corners of Victorian asylums to being exhibited in the world’s finest galleries, museums, and private collections. Director Amélie Ravalec previously directed Industrial Soundtrack For The Urban Decay, which traced the origins of Industrial music, from the crumbling industrial cities of Europe to America’s thriving avant-garde scene. Industrial Soundtrack was released theatrically in 2015 in 30 countries and acquired by ARTE TV in 2017. Ravalec’s debut film Paris/Berlin: 20 Years Of Underground Techno documented the underground movement of techno through the lens of two very different cities, from secret Parisian parties to Berlin’s Berghain club. Paris/Berlin was released in 2012 in 18 countries.